This study aimed to assess the single-dose toxicity of THJ-2201 by hematological and histopathological evaluation of liver and kidney specimens in Swiss albino mice. The experimental protocol included oral treatment of mice with different doses (5, 50, 300, 2000 mg/kg body weight of THJ-2201) for 24 h. At the end of the treatment, blood samples had been drawn, and renal and hepatic tissues have been excised from the experimental mice groups for hematological and histological examinations. Results showed that dose-dependent treatment with THJ-2201 leads to mild tremor clinical signs with low doses and photophobia (sensitivity to light) and even cessation of breathing as a potential cause of death with high doses in treated mice. The LD50 value of THJ-2201 was 822.20 mg/kg, which is considered as a chemical compound of low toxicity. Histological studies confirmed that liver and kidney toxicities have been manifested in the findings of congestion, necrosis, inflammation, and bleeding within the liver and to lesser extent in the kidneys. In recent years, the presence of new designer drugs has grown exponentially, and the current list is stunning. Generally, these products have been marketed as herbal mixtures and bought via the internet or at specialty stores below numerous emblem names, such as “Spice” and “K2.” Of many classes of novel psychoactive substances, synthetic cannabinoids account for the enormous majority which are commonly encountered (Tracy et al. 2017). In the early 2000s, synthetic cannabinoids were first reported in Europe. Between 2010 and 2011, the USA experienced a spike in popularity of synthetic cannabinoids, and the range of intoxication calls to poison control facilities accelerated by way of 240% in the 2 years (Cooper 2016). There are a growing number of reports which correlate synthetic cannabinoids and acute behavioral and physiological effects including acute kidney injury, convulsions, and sudden death. Moreover, numerous in vitro studies for several synthetic cannabinoids showed strong cytotoxicity in different cell types (Koller et al. 2013; Behonick et al. 2014; Gugelmann et al. 2014; Tomiyama and Funada 2014; Gatch and Forster 2016). In 2014, the new synthetic cannabinoid, THJ-2201 [(1-(5-fluoropentyl)-1H-indazol-3-yl)(naphthalen-1-yl) methanone], had been found in the USA, Japan, and Russia. By the beginning of 2015, THJ-2201 became a schedule I compound in the USA (Diao et al. 2017). THJ-2201 is analogous to AM-2201 and is traded illegally as an alternative to AM-2201, which was banned in 2011 and which affects target organs such as the heart, liver, and kidney, as well as the nervous system. It also has an effect on the eyes, respiratory function, and skin. THJ-2201 is used by smoking, fumigation, or eating to achieve the desired effect quickly (Trecki et al. 2015). AM-2201 has a very high affinity for cannabinoids receptor (CB1). Synthetic cannabinoids have a better affinity for cannabinoids receptors (CB1 to CB2 receptors); therefore, they are related to higher charges of toxicity and hospital admission compared to abusers of natural cannabis. The most commonly observed clinical signs that suggested toxicities related to synthetic cannabinoids include tachycardia, agitation and irritability, hypertension, vertigo, hallucination, nausea, confusion, delusion, dizziness, and chest pain. Acute kidney damage is also strongly related to abuse of synthetic cannabinoids (Madras and Kuhar 2013). In spite of growing concern about the increased rates of THJ-2201 use and its effects, there is a lack of information on how to cope with these problems. Consequently, the aim of this study was to evaluate the single-dose toxicity of THJ-2201 in Swiss albino mice on hematological and histopathological alternation of liver and kidney specimens treated with THJ-2201. THJ-2201 was purchased from Cerilliant Corporation, Round Rock, Texas, USA. The drug was initially dissolved in dimethyl sulfoxide (DMSO) (final concentration was 2%) and brought to the final volume with corn oil. DMSO and corn oil was also used as the vehicle control. Swiss albino male mice, aged 6 weeks and weighing 20–25 g, were obtained from the Experimental Animal Care Center, College of Pharmacy, King Saud University. All experimental mice were provided with free access to water and commercial pelleted diet (Saudi Grains Organization, Riyadh, Saudi Arabia). The animals were maintained under controlled conditions of temperature with constant humidity. The room was controlled with cycles of 12 h of light and 12 h of darkness. The mice were adapted to the laboratory environment for 1 week before starting the experiment. The single-dose study was carried out according to OECD 423 guidelines for testing of chemicals (OECD 2017). A total of 30 mice were randomly distributed into five groups, including one control group. Each group consisted of three males and three females. In acute toxicity, five groups of mice, with each group comprising six animals, were orally gavaged with THJ-2201 in doses of 5, 50, 300, and 2000 mg/kg body weight (bw) in a final volume of 0.25 mL. A control group of six animals received only vehicle control. The mice were individually observed for their general behavior at 1, 2, 3, 5, and 24 h after treatment. The number of deaths within this period was recorded, and LD50 (the dose that kills 50% of animals) was determined according to the probit method (method of least squares) using the [Software Stat Plus] (Ver. 2015 Build 5.9.8.5 ©2015). Necropsy was carried out on all animals, and renal as well as hepatic tissues was preserved in 10% buffered formalin for evaluation of histopathological alterations. At the end of the test duration, the mice had been added into the anesthetic chamber and sedated with 5% diethyl ether for 1 min. Blood from every mouse was collected from the heart to determine the hematological indices and was stored in tubes containing the anticoagulant ethylenediaminetetraacetic acid (EDTA). An automated hematology analyzer was used to investigate hematological parameters which include the subsequent: white blood cells (WBC), red blood cells (RBC), hemoglobin (HGB), packed cell volume (PCV), mean corpuscular volume (MCV), mean corpuscular hemoglobin (MCH), and mean corpuscular hemoglobin concentration (MCHC). The formalin preserved hepatic and renal tissue samples of THJ-2201-dosed rats, and the control group were processed in an automated tissue processor (Tissue–tek VIP-5, from SAKURA). The tissues were then processed by routine procedures to tissues in paraffin wax blocks. Paraffin sections (4–5 μm) were stained with hematoxylin and eosin, the conventional staining technique. Stained sections were examined for necrosis, apoptosis, inflammation, and vascular modifications in renal tissue. 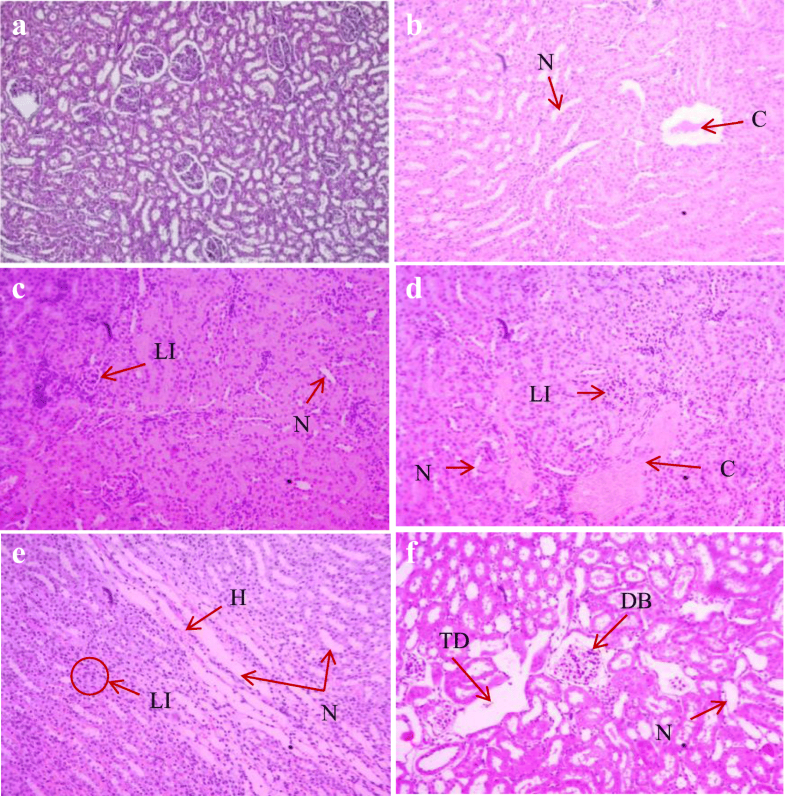 The hepatic tissue was evaluated for any change in the structure, portal or lobular inflammation, sinusoidal dilatation, and congestion together with the presence of granulomas, degeneration, necrosis, and fatty change. The significance of variations between means was compared at every time point the use of Duncan’s multiple range test (DMRT) after ANOVA for one-way classified data (Snedecor and Cochran, 1989). The administration of THJ-2201 in low and high preload doses brought about severe clinical symptoms, including tachycardia, convulsions, and difficulty in breathing. Further, an increase in locomotor activity of mice was also observed. Severe constriction and stiffness were observed for all muscles of the body. Similarly, narrowing of the eyes and prominent blood vessels in the ears were observed. There were deaths after dosage ranging from 1 to 24 h; however, the animals which survived exhibited normal behavior, similar to the animals in the control group. The toxicity was observed to be a dose-dependent phenomenon. The LD50 value was calculated to be 822.20 mg/kg bw (Table 1). The hematological parameters of the treated and control groups are presented in Table 2. There were no remarkable differences in hematological parameters after 24 h with the exception of lymphocyte counts which increased significantly in both males and females in all treated groups, compared to the control group (Table 2). THJ-2201-treated mice showed degeneration in liver and kidney tissues to varying degrees. Histological changes included congestion in the central veins, hemorrhage spots scattered between cells, inflammatory manifestations in the form of lymphocyte infiltration, and necrosis in the form of focal necrosis. Both male and female mice displayed the same effect on liver tissue after treatment with a low dose. These changes include presence of blood congestion and necrosis, an enlargement of the sinuses, and lymphatic infiltration in the bovine region (Fig. 1). At a dose of 50 mg/kg bw, both male and female liver tissue sections showed severe lymphocytic infiltration in the portal vein area, acute portal vein congestion with a necrosis of hepatic cells, and blood hemorrhage (Fig. 1). At a high dose, liver tissue section of male mice showed the presence of portal vein congestion on a large area, lymphatic infiltration in hepatic cells, and the occurrence of necrosis in the cells (Fig. 1). In the female mice, the presence of blood congestion with sinus prolapse with an increase in hepatic cells was also observed (Fig. 1). The renal lesions in mice treated with a low dose showed a large lymphatic infiltration in the area of the tubules, with swelling, necrosis, and congestion in the blood vessels. Congestion, lymphatic infiltration, and bulges were present with high doses (Fig. 2). Recently, designer drugs have become a phenomenon that has spread at an alarming rate. They have become a challenge for law enforcement agencies. In order to circumvent drugs laws, these compounds are synthesized with subtle changes in their chemical structures compared to conventional psychotropic substances (Diao et al. 2017). Because THJ-2201 has a varied legal status in different countries (Diao et al. 2016a), clarifying its toxicity and its various effects in experimental animals is an important issue for forensic investigation. There were many toxic symptoms exhibited by the treated mice that started immediately after dosage, which indicates the fast absorption and rapid distribution of the drug. According to the Hodge and Sterner toxicity scale of 24-h acute toxicity, THJ-2201 has low toxicity (Berezovskaya 2003). The LD50 of THJ-2201 was 822.20 mg/kg bw. This is a low value in comparison to natural cannabis drugs, particularly the active ingredient in the tetrahydrocannabinol (THC) cannabis, which has LD50 values of 42 and 482 mg/kg bw when administrated intravenously and orally, respectively. However, it was found that THJ-2201 toxic symptoms were similar to THC cannabis in occurrence, the most important of which is decreased locomotor activities with low doses and stimulated movements and jumping with high doses (Beaulieu 2005). In contrast, THJ-2201 symptoms appear faster and within a shorter time. In comparison to other designer cannabis drugs such as CP-47497, CP-55940, UR-144, JWH-133, JWH-149, JWH 073, and NM-2201(the orally LD50 values in mice were 5000, 5600, 5600,5000, 5600, 5600, and 2460 mg/kg/BW, respectively), THJ-2201 is considered more toxic (Cayman Chemical n.d.). Presently, THJ-2201 pharmacological statistics are unavailable, but they should possess affinity to cannabinoid receptors similar to AM-2201 (Diao et al. 2016b; Chimalakonda et al. 2012). There are several individuals who reported their experience on drug-user forums after the oral administration of THJ-2201. Most of the users used oil, milk, alcohol, and butter to consume the drug orally. They claim that outcomes began to appear after 50 min, peaking after ~ 3 h and subsiding after 4–5 h. The user also claimed that effects were extremely similar to dextromethorphan and multiple bongs. Signs mentioned by most of them covered slamming the head several times into the wall or on the floor, depressed breathing, increased heart rate, and violent shaking (Drugs-Forum 2018). Unfavorable reactions along with kidney pains, muscle spasms, and paranoia have been also stated on drug-user forums (Diao et al. 2016b). This is the first study to explore the cytotoxic effects of THJ-2201 on blood parameters and liver and kidney tissues. Hematological parameters are considered to be one of the critical systems to determine drug toxicity in humans and animals (Wei et al. 2015). This study indicates that there was a significant difference in lymphocyte count after 24 h of treatment with high and low doses, which indicates that THJ-2201 had specific effects on lymphoid cell contents. Although THJ-2201 has low toxicity, its toxic effects on liver tissue were close to the effect of cocaine, which is classified as highly toxic and causes liver damage and inflammation (Vilela et al. 2015). The inflammation, necrosis, and congestion seen in kidneys of THJ-2201-treated mice were similar to the changes found by Dargan et al. (2014), who studied the effects of methoxetamine (analogue of ketamine) in renal toxicity in mice. THJ-2201 is of low acute toxicity but had rapid effects after administration. The symptoms of toxicity started out from moderate tremors at low doses, with photophobia and even cessation of breathing with high doses. 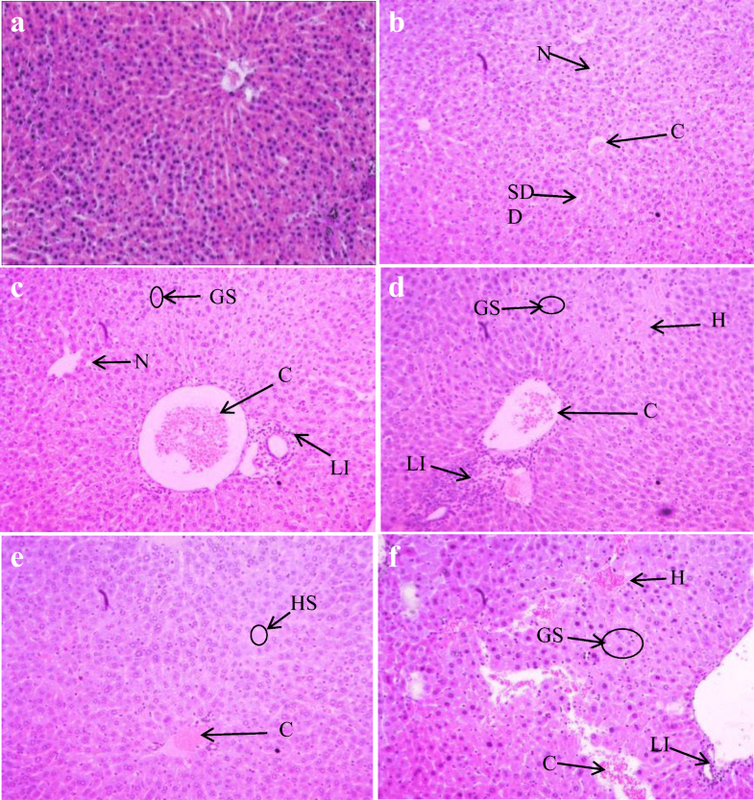 In hepatic tissue, ballooning degeneration of varied extent and severity prevailed in the drug-dosed animals with evidence of congestion, lymphatic infiltration, and necrosis. In all mice, necrosis, lymphatic infiltration, and congestion predominated in renal tissue. The authors make substantial contributions to conception and design, and/or acquisition of data, and/or analysis and interpretation of data; the authors participate in drafting the article or revising it critically for important intellectual content; the authors give final approval of the version to be submitted and any revised version. Ethical approval obtained from the Experimental Animal Care Center, College of Pharmacy, King Saud University.